Custom mint tins with a clear lid and a direct imprint on the mints! 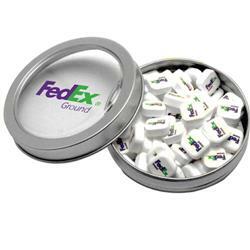 This slim see through tin filled with mints printed with your logo is the perfect way to do that. 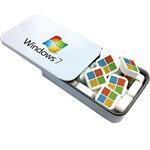 The tins can also be filled with with a variety of candies and nuts. Ask for details. A great memorable mint tin! Production Times Available: 7 to 10 working days standard. 1" H x 3-1/8" Dia. 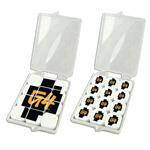 Typical Imprint Area(s): Decal Size 1.6929" Dia. 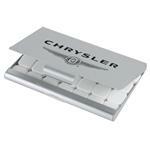 Direct Imprint Size 2.25" Dia. Price includes one design on mint, each additional design is $0.10 and an additional setup, PMS match available but CANNOT guarantee match - if match needed a production sample must be ordered in advance @ $42 ($42 credited upon re-order from client. ), Tamper evident shrink wrap-other companies use tape or stickers, Ingredients on every package, All candy options are made in America, Can be filled with a variety of candies and nuts, Inquire.